Rising energy costs are affecting everyone's budget. According to the U.S. Department of Energy, heat lost through windows can account for 10 to 25% of your heating bill, and even new energy efficient windows allow heat loss. If you've not had an energy audit on your home yet, a simple way to check for heat loss is to simply put your hand on the window sill and see if you feel cold air. Even a small draft means a big heat loss There is also direct conduction through the glass, which make rooms colder when left exposed. Today’s technology provides us with a huge selection of insulating window treatments, from honeycomb shades to decorative blinds and draperies. These new treatments prevent heat loss and provide insulation to keep your home warm in winter and cool in summer, as well as beautifying the decor in the room. 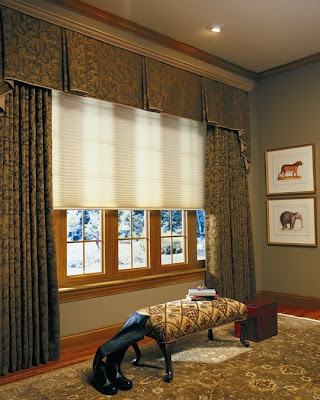 Additionally, window coverings control light and provide privacy. Window shade products have R-value (resistance value) ratings which measure a product's resistance to heat loss when in a closed (lowered) position. Window coverings with a high R-value can provide much needed insulation and significantly reduce heat loss. The higher the R-value, the more insulation a window product provides. A single layer of uncovered window glass has a winter R-value of about 0.88, while a double-glazed window has a value of about 1.75. By selecting an energy-efficient window treatment, you can help increase the R-value one to five points. Combining shades and draperies will increase the insulating value. 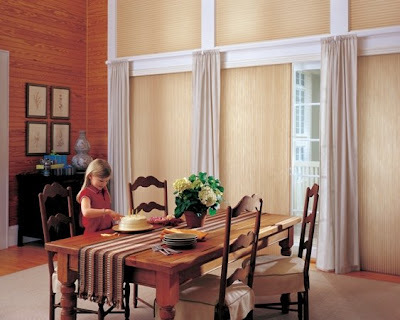 It is important to install shades and draperies properly to minimize gaps that would allow air to filter through. Consult with me to determine what product is best for your window, budget and style.